These easy patties have a Persian feel with the gentle spices and fresh herbs. Sabrina serves hers on sticks for a fun party snack, but you could put them in wraps, or a mezze-style platter. Cook the bulgur wheat for a little longer than the packet instructions say, so it’s very puffy (about 20 minutes). Rinse under cold water to remove the starch and leave to drain until cool enough to handle. Mix all the ingredients, except the oil, for the bulgur wheat balls together. Squeeze the mixture using your hands so it sticks together. Shape the mixture into golf-ball sized balls or patties, don't worry about making them into perfect balls. Place in the fridge for 30 minutes. Heat a large frying pan and add the oil, once hot add the balls and fry or 3-4 minutes. Finish them in the oven for 5-10 minutes if you like. 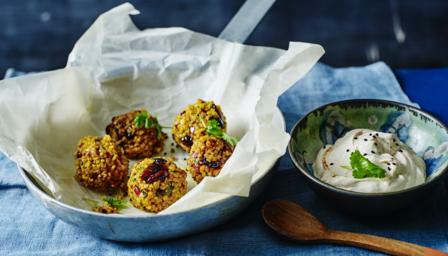 Serve on sticks with a drizzle of Greek style yoghurt, sweet tamarind sauce, a sprinkle of nigella seeds and more fresh coriander.